Sakshi is Trend and Innovation Consultant – India at Mintel, and is responsible for providing clients with cutting-edge insights, thought-provoking opinion and strategies within new product development, with a focus on the Indian market. With the growing awareness of the role nutrition plays in today’s busy lifestyles, Indian consumers are looking for food and drink options which are both convenient, like biscuits, but also help to quantify the intake of nutrients. While health is a priority for Indian consumers, they are not willing to compromise on indulgence as well as taste and biscuits, in general, are considered to be an indulgence. Mintel research showcases that Indian consumers are willing to experiment and would like to try biscuits with regional flavours or influenced by global trends. This points to an opportunity for Indian biscuits manufacturers to look at better-for-you launches that don’t compromise on taste. Mintel research reveals that almost nine out of ten Indians have eaten biscuits in the last six months, indicating the scope and growth for biscuits as a segment in India. With indulgence being a crucial driver in the sweet biscuit industry, brands have sought to innovate around a wider variety of flavours, textures and formats to cater to this demand. Brands manufacturing premium biscuits can look to incorporate inherently healthy ingredients without compromising on taste. Last year saw companies like Hershey and United Biscuits launching high-protein biscuits, addressing the need for more protein-based food and drink. Furthermore, as consumers become health conscious, there has been a spotlight on digestive health biscuits. The health value-addition of biscuits like these will not mean much unless consumers are made aware of them. It is vital that brands visibly call out the nutritional benefits their biscuits have to offer. ITC’s Sunfeast Marie Light Vita Biscuit says it contains 11 essential nutrients and claims to contain zero trans fat. These cookies by Hershey’s are said to provide healthy energy, protein, omega-3, fibre and vitamins. It is said to have whole wheat, oats and soya. As consumers are seeking less processed and more natural food, biscuit brands can look to use more natural ingredients that also address the health quotient. Today, natural ingredients like grains, multi-grains and oats are being used in biscuits. 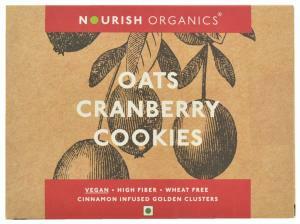 These cookies are made with warm cinnamon, vanilla and wholesome oats, and are said to be filled with antioxidants. It claims to be high in fibre, contain zero trans fat and is free from wheat, preservatives, added colours and flavours. While glucose biscuits are popular in India, Mintel research highlights that a high percentage of consumers also consumed cream-filled or low-calorie biscuits last year. The rise in disposable income and urbanisation have facilitated the premiumisation trend in the biscuit category. Brands can incorporate ingredients like nuts, seeds, fruit and traditional grains to add an element of premiumisation. These cookies are described as premium traditional homestyle cookies. 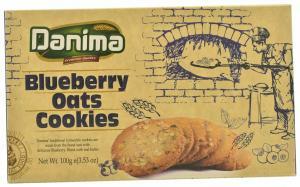 It is said to be made from the oats with blueberry and blended with real butter.